Our canister style load cells are robust and often hermetically sealed construction with spherical radius on one or both ends, typically with self-restoring alignment features. Hence the model style name, single points are typically used in single load cell applications. The unique feature of a typical single point is the mechanical compensation/correction for off center loading. 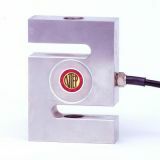 S-Beam Load Cells are used in tension and compression applications. Wide range of capacities available. Coti Global's double ended beams are very common in tank/hopper applications, as well as truck scales.